It was supposed to be over with a ceasefire and withdrawal. But over the last 24 hours, there have been claims of executions by government troops and stories of bombardment. The Current speaks with those still inside — trapped. 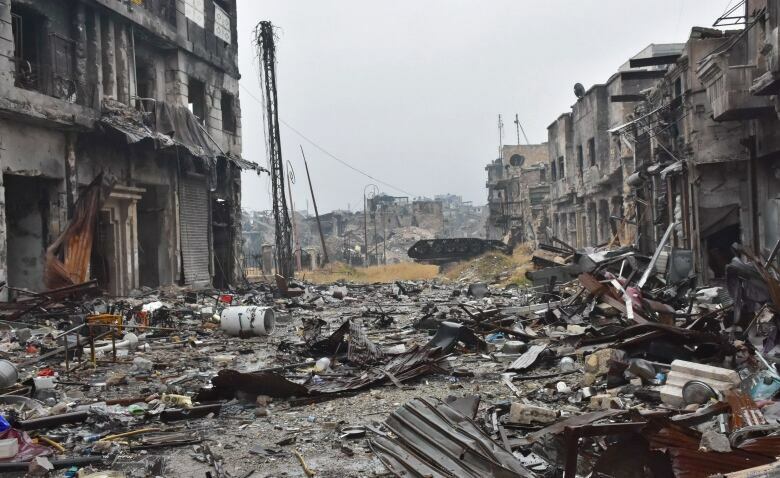 The vicious, four-year long battle for the Syrian city of Aleppo appears to have finally come to an end — although the war across the country is far from over. It's a victory for Bashar al-Assad's regime that leaves thousands of civilians dead — and what was once Syria's largest city — in ruins. According to reports, a ceasefire and evacuation agreement were brokered for civilians and anti-government rebels who remain there. 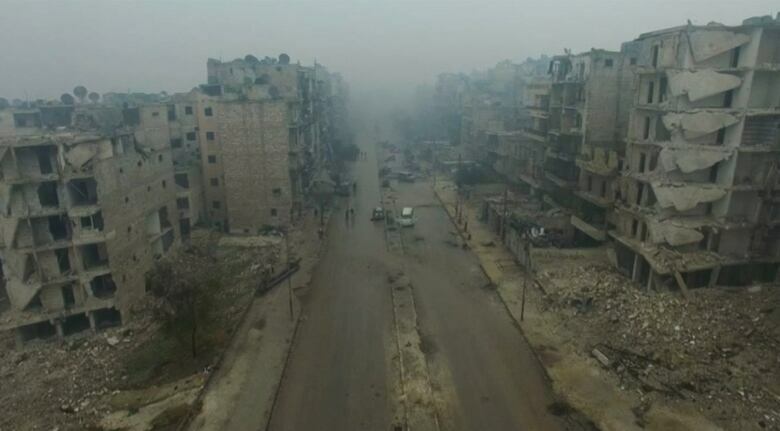 Zouhir Al-Shimale, a freelance journalist based in eastern Aleppo, tells The Current's Anna Maria Tremonti the situation is "unbelievably intense." "They [civilians] are dying in the streets because they have no treatment," says Al-Shimale as bombs can be heard in the background. "The situation is really intense…They will not let anybody leave." He estimates about 50,000 - 60,000 people remain in the city, including women and children. About 70 to 80 per cent of those left are civilians, according to Al-Shimale. "Many people are screaming from the streets." As Aleppo was falling, the United Nations reported that pro-government forces had killed at least 82 civilians, including women and children, on the spot - in their homes and on the streets. "I was expecting today morning that there would be an evacuation but there has not been any evacuation," Al-Shimale tells Tremonti. 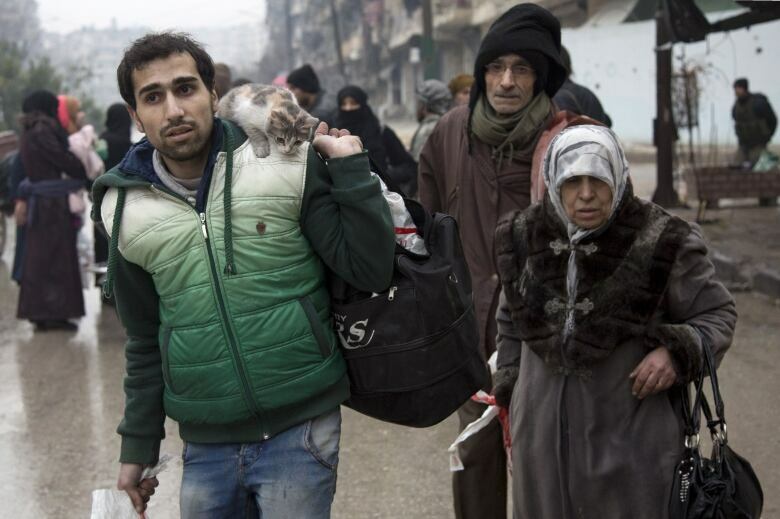 "Just go and do something for Syrian people who are in the streets. Try to demonstrate against the Russian and the Syrian state — try to put pressure against them," Al-Shimale pleads. "We might be killed … I will have hope. Maybe we will survive … As long as I have breath in my lungs and my heart is beating so I will keep hope." Lina Shamy, anti-regime activist is among a group of displaced people who gathered in small area of the city. "Everyone was fleeing from my district," she tells Tremonti. "There was a state of horror, there were lots of bullets above our heads. They were shelling all over." After a day and a half of laying low to stay safe, Shamy went outside to find the world around her unrecognizable. "When I went out, everything has changed due to that intense bombing." She says she's heard reports that there are people trapped under the wreckage with no help in sight to get them out. 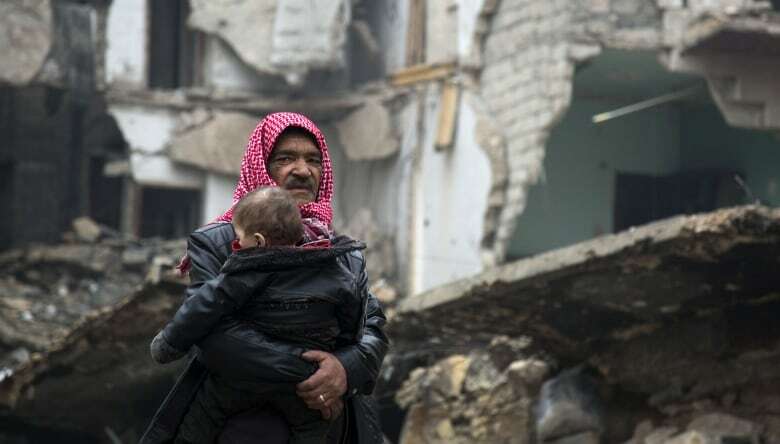 "The government of Syria is obliged under international law to provide medical assistance to all sick and wounded civilians and fighters alike," Rupert Colville, spokesperson for the UN High Commissioner for Human Rights tells Tremonti. He says the calls to hold the Syrian government accountable to international law has been going on for five years to no avail. "That's where the abject failure of the UN Security Council is most obvious." This segment was produced by The Current's Lara O'Brien, Shannon Higgins, Julian Uzielli and Sujata Berry.